How should the U.S. respond to the growing numbers of families and children arriving at the border? Immigration and Customs Enforcement and Customs and Border Protection have even begun releasing migrant families into the U.S. almost immediately instead of holding them in detention, Mark Morgan, former chief of Customs and Border Protection under Barack Obama, told Axios. He said this could create an additional incentive for migrants. The big picture: The latest data come at a time when the Trump administration is trying to make the case that there is a true emergency at the border, in the face of skepticism in Congress and pushback over his national emergency intended to fund a border wall. The Trump administration is expanding a policy that forces some asylum seekers to stay in Mexico until their case is completed. And President Trump has vetoed Congress's efforts to end his declared national emergency. Between the lines: There are real families and children who have fled dire circumstances in their home nations who are coming to the U.S. for asylum. But there are also real logistical issues at the border and in U.S. immigration policy. Immigration is already a complex issue, but it has become an increasingly political one as well. 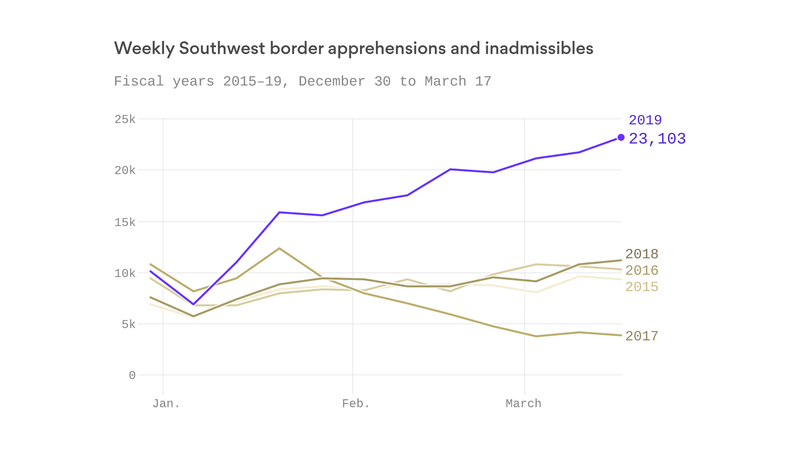 By the numbers: Historically, the number of border crossers begins escalating around March due to the warmer weather, and typically doesn't peak until May. The U.S. has had this much border activity in the past, but could reach as many as a million apprehensions and inadmissibles this year, according to Morgan — levels not seen for at least a decade. One big change: Back when reaching a million border enforcement actions in a year was common, the vast majority of migrants were single, Mexican adults who often made multiple attempts to cross the border. Now, DHS is dealing with the complexity of caring for tens of thousands of Central American parents and children. Laws that enabled the quick deportation of single, Mexican adults do not apply.